Baked Mediterranean Chicken, an easy to prepare recipe that’s packed with delicious bold flavors of a wet rub. 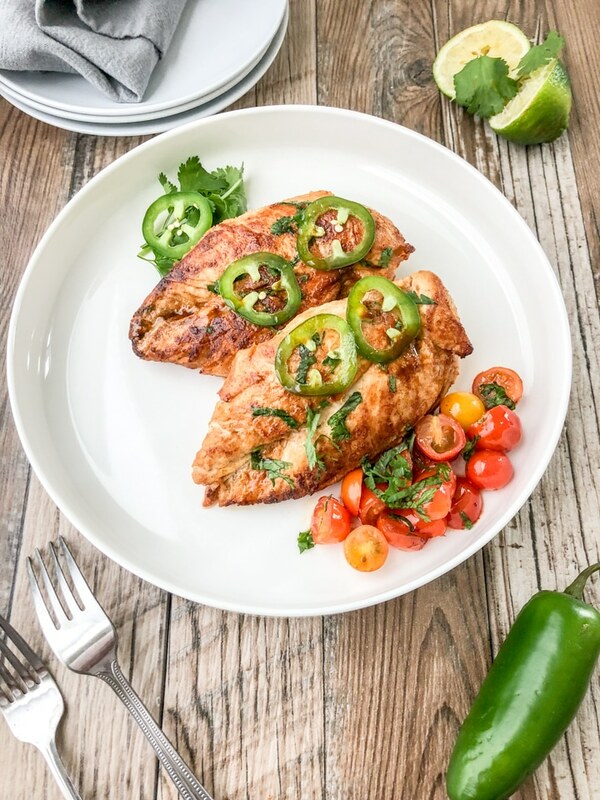 A blend of garlic powder, cumin, coriander, and smoked paprika combined with a liquid base such as olive oil and fresh lime juice creates the perfect marinade to intensify the taste of each chicken breast. Even if you tend to shy away from cooking chicken breast, due to its low moisture content. I think you’ll appreciate the simplicity and juiciness this wet rub offers to this easy Baked Mediterranean Chicken recipe. In this post, I’ll walk you through a few simple key elements that will take boring ole’ chicken breast to the next level. In my opinion, extra care needs to be taken when cooking chicken breast… why? Well, chicken breast doesn’t contain the same level of fat as dark meat and because of that chicken breast tends to dry out much faster and can lack in flavor compared to dark meat. With that being said, you can use these simple steps to prepare a quick and easy weeknight dinner of Baked Mediterranean Chicken. Wet Rub: The key to this easy Baked Mediterranean Chicken recipe is the wet rub. It contains a blend of my favorite Mediterranean spices, extra virgin olive oil, the juice of one lime or lemon, and salt. Sear: I love searing and try to sear whenever possible. Although this step is optional, I think it’s worth the time. Searing really enhances the flavor of different meat and chicken breast is no exception. It only requires about 5 to 7 minutes on both sides and will definitely enhance the flavor and beauty of the chicken breast. Bake: After searing the chicken breast, finish the cooking process by placing the oven proof skillet in the oven. 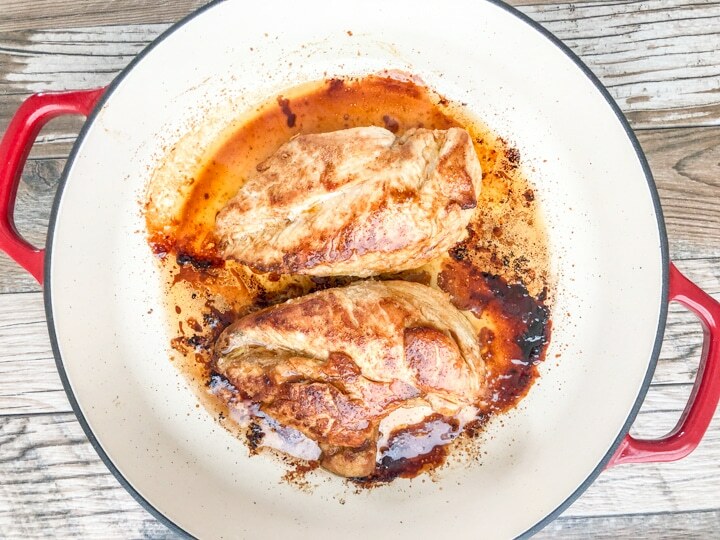 Here, you’ll continue cooking the chicken breast until the meat is no longer pink paying extra attention to not overcook or insert an instant read thermometer into the thickest part of the breast for doneness. You will know the chicken breasts are done when they reach 165 degrees Fahrenheit (75 degrees Celsius, they are done. I also like chopping up the chicken breast and using it to make chicken tacos, burritos, or for a quick stir fry. While chicken breast is baking in the oven. Add the cherry tomatoes around the chicken breast about 10 minutes before the chicken is done. As a meal prep idea, chop each chicken breast and store it in an air tight container and place in the fridge or freezer until you’re ready to use. This is convenient for last minute lunch or dinner ideas especially when you’re in a time crutch. I’d love to hear your comments in the comment section below. If you love Pinterest or Instagram, I’d love for you to follow me. One other thing, if you could rate the recipe using the star rating below would be great too. 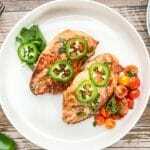 Baked Mediterranean Chicken - A quick and easy dinner recipe with a fragrant wet rub that consists of olive oil, fresh lime juice, granulated garlic, cumin, coriander, and smoked paprika that gives each chicken breast a flavorful punch. 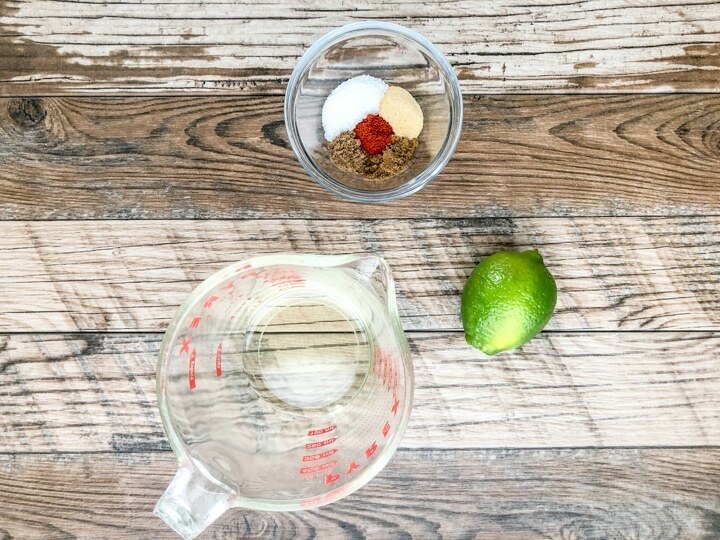 In a measuring cup, add 1/4 cup of extra virgin olive oil, lime juice, and seasonings and whisk. Set aside. Wash 4 chicken breast and pat dry with paper towels. Place on clean plate. Set aside. Open a large freezer zip loc bag and place it in a large bowl. Place the chicken breast inside of the zip loc bag and pour over the wet rub. Close the zip loc bag securely while releasing as much air as possible from the bag. 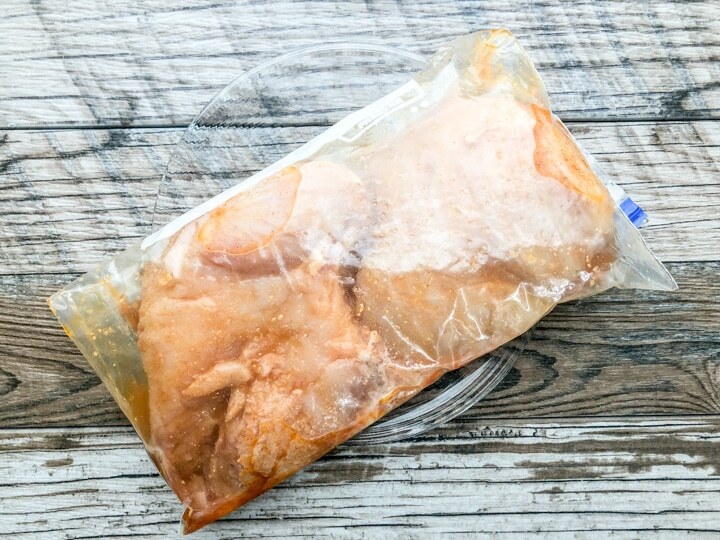 Move the zip loc bag around to coat each chicken breast. 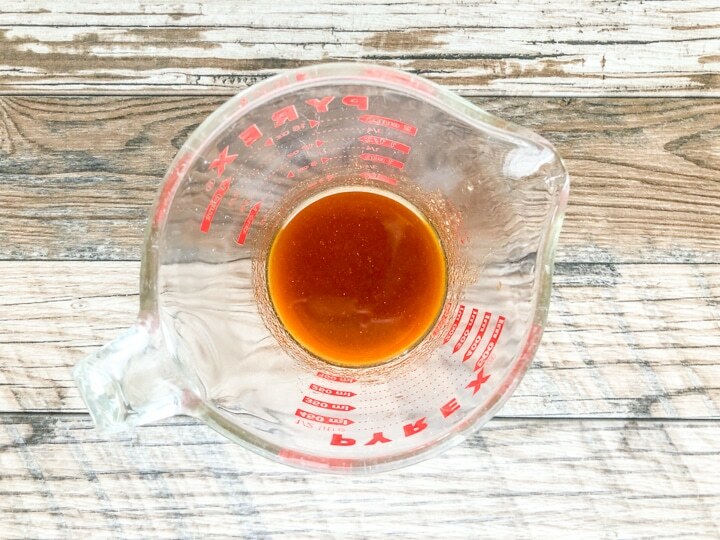 Allow the chicken to marinade for 15 to 30 minutes at room temperature. Try not to exceed 30 minutes. Place an oven proof skillet over medium. Add extra virgin olive oil to the skillet. When the skillet is hot, add the chicken breast. DO NOT OVERCROWD THE SKILLET AS THIS WILL NOT ALLOW THE CHICKEN BREAST TO SEAR PROPERLY. INSTEAD IT WILL STEAM THE CHICKEN. Therefore, cook the chicken in batches if necessary. Sear chicken breast on both sides for about 5 to 7 minutes until you get a nice medium brown outer coating. After all chicken breast are seared, place all 4 chicken breast in the skillet. Place oven proof skillet in the preheated oven until chicken breast is cooked through and no longer pink or instant read thermometer reaches 165 degrees Fahrenheit or 75 degrees Celsius. DO NOT OVERCOOK AS THE CHICKEN BREAST COULD BECOME DRY. This may take about 27 minutes depending on your oven. If serving with blistered cherry tomatoes, wash, pat dry, slice tomatoes in half and drizzle with a bit of extra virgin olive oil and a pinch of salt. Place in the same skillet as the chicken about 10 minutes before the chicken is done. 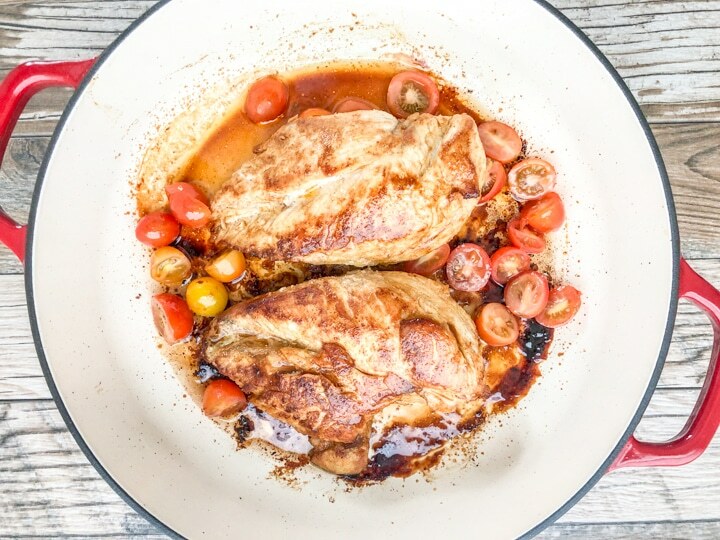 Remove skillet from the oven and place chicken breast on a clean plate to rest. This will allow the juices to redistribute back into the meat. Therefore, do not cut chicken breast immediately. You can skip the searing step if you'd like. It's not necessary but is an extra step I like to take. Placing all 4 chicken breast in the same skillet or pan is perfectly fine.